Since cereal typically becomes mushy and sinks to the bottom of the bowl, advertisers use glue to make the pieces stay on top, and kept in its original form. 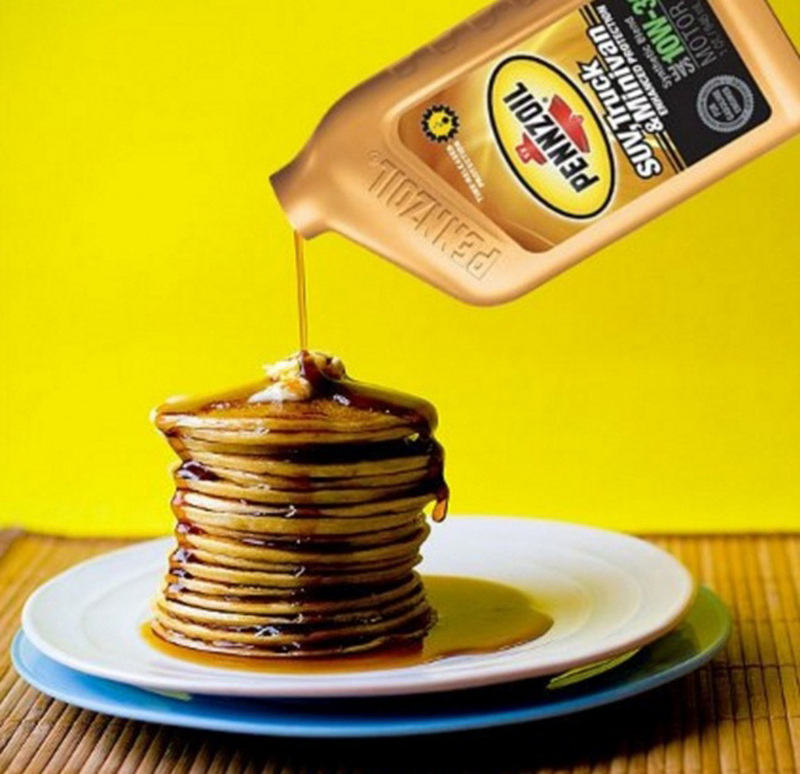 While advertisers want you to believe their stack of pancakes is drizzled in mouthwatering syrup, it wouldn't be wise to eat the prop used in the studio. That's because the pancakes are actually doused in motor oil instead. This change is due to the fact real syrup would soak the pancakes, making them soggy and unpresentable. When they use motor oil, the condiment just glistens on top. When we see a fizzy class of soda, did you know the bubbles seen aren't there naturally. Since carbon dioxide doesn't last as long, putting in an antacid tablet makes the bubbles reappear due to the immediate chemical reaction. Since cake should be a moist desert, if it's put on a plate too long, it's bound to crumble. By putting pieces of cardboard between the slices, the cake slice is able to keep its form and entice sugar-fiend crowds. 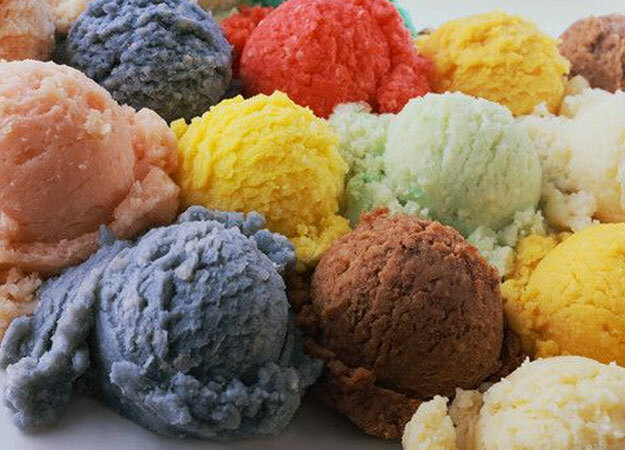 Since a company's real ice cream would quickly melt under the hot lights, it's replaced with mashed potatoes mixed with in with various food coloring. Don't you hate it when you see a nice brown bun in commercials, but when you see them in the store they're pale in comparison? Well that's because food stylists rub brown shoe polish on the buns before the product is filmed. Once noodles are cooked, they tend to dry out shortly after, so food stylists glaze glucose syrup on top of it to keep it looking like it's ready to be devoured. When food comes out of the oven, it can be piping hot. Luckily for us, it doesn't last long for us to eat, but for advertisers, they know consumers wouldn't be tempted by a meal that automatically comes out cold. So, they cunningly place either a warmed up, wet cotton ball or tampon behind the product in question to make it look like the steam is coming from the foot itself. In commercials we often see the meat looking plump and ready to be dug into, but of course, it's not exactly what it seems. Not only is the chicken roast undercooked to keep it looking juicier, but it's stuffed with paper towels to make it look bigger than it actually is. Ever notice the fruit in advertisements shine, but when you open your refrigerator they happen to look unappetizing and dull? Well, just like hairspray helps your hair look shiny, it creates the same results on your favorite fruits. Unfortunately, since commercials can take a long time to shoot, the foam doesn't stay for nearly as long. To keep up with appearances, advertisers often put dish soap into the glasses of beer to reproduce the foam, which lasts significantly longer.